Winning team of Warren Cotton and Kirk Lewis. This past weekend Crappie USA held a qualifying event at Washington Lake in Washington County, Mississippi where the Memphis, Tennessee team of Warren Cotton and Kirk Lewis took an overwhelming victory weighing in 7 crappie totaling 15.17 pounds on Big Bite Baits. Weather conditions hampered anglers in the tournament on Saturday with temperatures running from 40-44 degrees and falling all day. To top it off it rained all day with bone chilling Northeasterly winds 20-25 MPH. Anglers from 10 different states were competing for not only cash and prizes, but a chance to advance to the prestigious Cabela's Crappie USA Classic. This year's classic will be held October 24th-27th, 2012 on the Barkley/Kentucky Lakes at Cadiz, Kentucky. Taking first place was the team of Warren Cotton and Kirk Lewis of Memphis, Tennessee with a total weight of 15.17 pounds and earning $1,200.00. Warren and Kirk caught 35 fish for the day using orange/chartreuse Big Bite Baits slow trolling in 12 feet of water on the west end of the lake. "This is one of the heaviest weights in years for 7 fish we've seen and would be in the record territory on most lakes", said Van Vactor. Second place went to the Dyersburg, Tennessee team of Brian Ramm and Jeff Heathcott with a total weight of 8.64 pounds and earning $800.00. 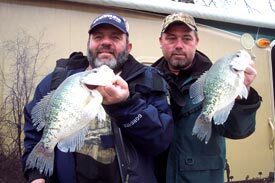 Brian and Jeff were slow trolling crappie rigs with red/chartreuse Southern Pro Tubes in the center area of the lake. The team caught 15 fish for the day. In third place was the team of Ricky Smith of Brookhaven, Mississippi and Jimmy Smith of Bogue Chitto, Mississippi with a weight of 8.22 pounds and earning $400.00. Ricky and Jimmy were also slow trolling using minnows in 12 feet of water from the south to north end of the lake to catch 35 fish for the day. Eli Rowell of Foxworth, Mississippi and Terry Stewart of Clinton, Mississippi took fourth place with a weight of 7.89 pounds. Eli and Terry were slow trolling minnows 8 feet deep in 13 feet of water in the main center area of the lake. Fifth place went to Steve Coleman and Ronnie Capps of Tiptonville, Tennessee with a weight of 7.53 pounds. Steve and Ronnie were fishing the center area of the lake using Southern Pro jigs on B'n'M Poles to catch 15 fish 8 feet deep in 17 feet of water. Jason and James Westerberg of Conway, Arkansas took first place in the Ranger Cup Semi-Pro Award winning $250.00. 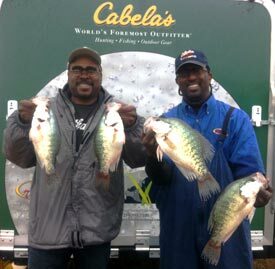 David Davidson and Novis Fisher took third place, but Davidson's 3.26-pound crappie was the big fish of the event. First place in the amateur division was Steve White of Monticello, Arkansas and David N. White of White Hall, Arkansas with a weight of 9.52 pounds and earning $600.00. Steve and David were using a different technique than other anglers by bouncing their baits off the bottom using orange and chartreuse tubes on Roadrunner heads in 16 feet of water on the south end of the lake. The team only caught 7 fish for the day, but they were 7 fish good enough to take first place in the amateur division of the event. Second place went to Ricky McWilliams of Halls, Tennessee and Matthew Tosh of Dyersburg, Tennessee weighing in only 4 fish for the day totaling 8.87 pounds and earning $400.00. Ricky and Matthew also took 2nd big fish of the day with a 2.72 pounds and earning them an additional $90.00. The team was slow trolling the middle of the lake in 8-10 feet of water using orange/chartreuse glow Southern Pro jigs. Taking third place was the team of David Davidson of Halls, Tennessee and Novis Fisher of Friendship, Tennessee weighing in 7.5 pounds and earning $200.00. David and Novis also had big fish of the event with a 3.26 pounds giving them an additional $210.00. The team was slow trolling jigs tipped with minnows in 10 feet of water on the southern end of the lake. The team only caught 7 fish for the day. In fourth was the team of David McWilliams of Yazoo City, Mississippi and Lance Evans of Flora, Mississippi with a weight of 7.48 pounds. David and Lance were slow trolling orange/lime/chartreuse jigs in 10 feet of water near the middle of the lake. Fifth place went to the St. Louis team of Steve and Daniel Gentz weighing in 5.31 pounds. Steve and Daniel were spider rigging in 15 feet of water running double minnow rigs 8 feet deep using their B'n'M Poles to catch 5 fish for the day. Ricky McWilliams of Halls, Tennessee and Matthew Tosh of Dyersburg, Tennessee took first place in the Ranger Cup Amateur Division Award winning $250.00.